The Willamette Week broke the news that Live Nation plans to open a concert venue in the Lloyd West Anchor building, formerly home to Nordstrom. NW Natural will move from Old Town into the 250 Taylor office building in 2019, reports the Portland Tribune. The Portland City Council approved a resolution outlining priorities for how the $258 million housing bond should be spent, according to the Oregonian. According to the Portland Tribune the city council will this week review a map showing any potential conflicts held by members of the West Quadrant Plan Stakeholders Advisory Committee. The plan, adopted by council in 2015, informs the larger Central City 2035 Plan currently before council. 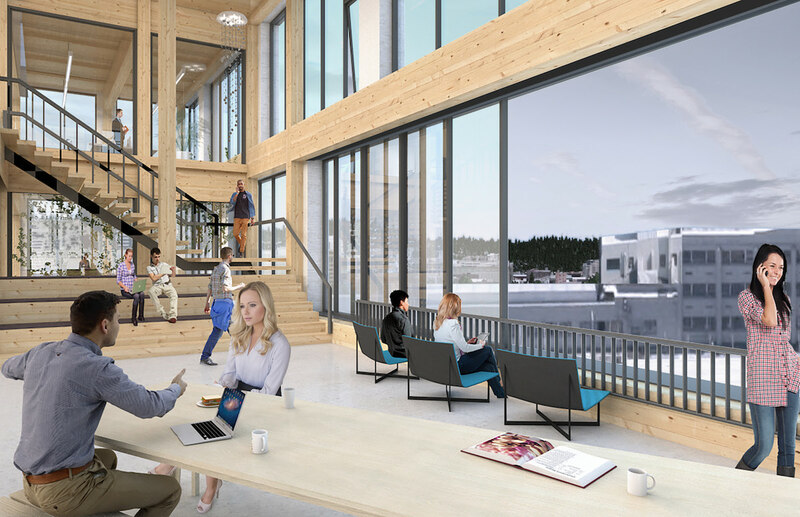 The Business Tribune wrote about two cross-laminated timber buildings being designed by Hacker, including the Eastside Office at 525 SE MLK. As the Portland area sets itself up as a center for mass timber construction, the Business Tribune asked what is it, and where can we see it? As Adidas gets ready for a major expansion in Portland, the Oregonian sat down with executive Mark King to discuss the sportswear company’s future plans. This entry was posted in 250 Taylor, Adidas Campus Expansion, Central City 2035, District Office, Hacker, Lloyd West Anchor Remodel, weekly roundup. Bookmark the permalink.